You can tell that it is spring: daylight lasts longer, flowers bloom, and birds are chirping. But it’s not only the weather that changes with the seasons: your meals can change, too. Gone are the warm soups that keeps you happy during the winter, and before you know it, you’re saying hello to spring salads (and chilled soups)! 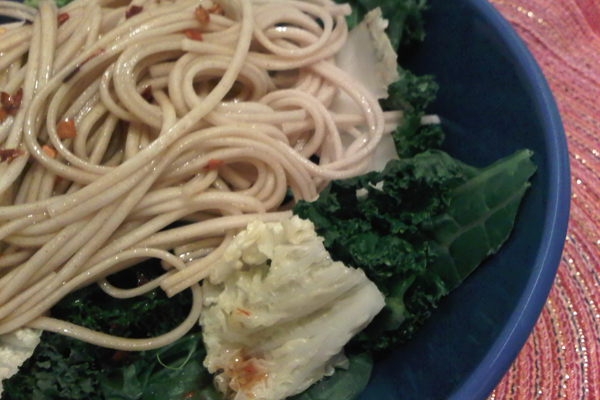 But sometimes I still miss having something warm and earthy so I came up with a warm soba salad for the spring. Ready? Here goes! Boil water in a hotpot. Pour it into a large bowl and add soba noodles. Let soak for about 5 minutes. In the meantime, rinse vegetables. Place then in a bowl and sprinkle water on top. Cover the bowl with a wet paper towel. Microwave on high for 30 seconds. Take the bowl out and lift up the paper towel carefully as you try not to burn yourself! Stir the vegetables. Cover the paper towel and repeat the microwave process twice more. Drain water out from the soba noodles and place the noodles on top of the vegetables. Mix together olive oil, soy sauce, honey (or agave), red chili flakes, and salt, and whisk until combined. Pour the sauce on top of the soba salad.